JV will practice today at West Woods. We will have a JV tournament next Tuesday 05-03 at Applewood and Tuesday 05-10 at Lake Arbor. Gold Crown has cancelled today’s golf tournament due to weather. We will have a voluntary practice at Indian Tree from 3:30-4:30. 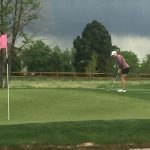 Arvada West won the Jeffco 5A/4A golf tournament Monday 04-04. Ali Peper was the medalist shooting a 76. Miranda Schiffbauer 83, Reagan Robinson 86, Leigh Robinson 87, and Kaiya Wahl 90 finished in the top 9 as well. Congrats girls and good luck next week. Girls Junior Varsity Golf, Girls Varsity Golf · Mar 31 03-31voluntary practice at Park Hill indoor driving range. West Woods Golf Course is closed so we will have a voluntary practice after school today from 3:15-4:00 at Indian Tree.